Beyond organic reach and engagement, videos are often the most “viral” pieces of content on the web. Just look at your Facebook News Feed and you’ll see how the most shared posts are often video posts. Unfortunately, videos tend to be more costly and time consuming to script, shoot, edit and produce. Often, you’ll need to engage a professional videographer or even a production crew to do one for you. Thanks to the Ultimate Guide to Facebook Advertising, I’ve picked up a couple of useful tips on producing winning Facebook videos that you can use. The length of your videos really depends on your intent. Short videos can communicate your message quickly and take your viewers straight to your Call To Action (CTA) at the end. On the other hand, long videos are useful for more explanation and may produce more shares. Hot Tip: As a general rule, the more expensive and complex your product/service is, the longer you should target your video to be. I first heard of this three-step formula from the Perpetual Traffic podcast and I found it highly instructive. Unfortunately, life got the better of me and I wasn’t able to put it down in words. Until now. This is probably the first most important strategy, given the huge amount of content that your Facebook target audience will be scrolling through. You probably know that Facebook auto plays your video. However, the audio may be silent and require your audience to click on it. Hence, it is important to produce videos that work well without sound! Use a large and exaggerated motion at the start of the video, ie the crucial first 3 seconds of your video. This could be someone waving their hand, or an item flying across the screen. Include a text overlay, which could be subtitles (useful for folks watching your videos on public transport). Educate – As a trainer and consultant, I firmly believe in the power of education. You don’t have to have fancy Hollywood style production quality; just a Power Point presentation while recording your computer screen may work. Demonstrate – This works well for more complex products and services, and is useful for product demos and walk-throughs. Inform – This is slightly more advanced than Educate, and could include the latest news in your industry, or recent research findings. Entertain – Naturally, entertainment is huge on Facebook, and your video should seek to follow it. What do you want your viewers to do after they’ve watched your video? That is your Call To Action (CTA). Of course, this really depends on the nature of your content and campaign, but incorporating a CTA at the end of your video (or in your text caption) can help you to improve your marketing effectiveness. For some, you may weave in a CTA in the middle of your Facebook video, while others may include it only at the end. Have a look at some of the top Facebook videos for 2017 below, and see if you can identify the above components in these Facebook videos. 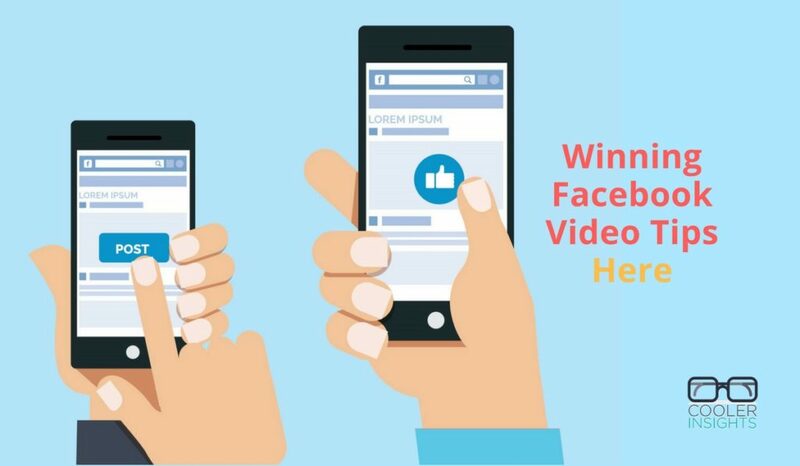 As you’d imagine, creating a winning video post or video ad for Facebook can be quite challenging, even with the advice that I’ve garnered above. Like any good social media marketing strategy, you need to do lots of tests to see which video types work better. If you are planning to produce your own videos, it’ll be useful to either take up a course in video production or pick up some of the basics with easy to use apps like iMovie or Movie Maker, and a whole lot more. Have you tried video marketing on Facebook before? What are your experiences like?